Home / Resources / Count Us In! Toolkit 2019 / What are the Key Messages? What are the Key Messages 2019? Throughout the country, we see a growing consensus that improving student attendance is an essential, cost-effective strategy for ensuring student success and reducing achievement gaps. Nationwide , as many as one out of seven students are chronically absent. When students are chronically absent, they are missing on average two or more days a month, or 10 percent or more of school days over the academic year. Chronic absence is a sign that students and families may be experiencing barriers to getting to school or are disengaged because their school experience makes them feel unsafe and unsupported. Attendance reflects whether what happens in school encourages students to show up every day or exacerbates the negative impact of challenges experienced in the community or at home. Chronic absence is a problem we can and must solve if we want all children and youth to benefit fully from an education that prepares them for success in school, work and life. Below are key messages that everyone—districts, schools, preschools, health providers, public agencies, advocates, expanded care programs, community organizations, faith-based institutions, elected officials, businesses and families—can use to rally their communities to take action on attendance. 1. Good attendance contributes to students doing well in school and eventually in the workplace. The early school years are essential for laying a foundation for strong attendance and academic success in future years. By middle and high school, poor attendance is even more predictive of dropout. Each absence represents a preventable lost opportunity to learn in the classroom. We can’t afford to think of absenteeism as merely a lack of compliance with school rules. 2. Students are at risk academically if they are chronically absent (missing just two days a month or 10 percent of the school year). When too many absences occur, they can affect learning, regardless of whether absences are excused or unexcused. Sporadic, not just consecutive, absences matter. Before you know it – just one or two days a month can add up to nearly 10 percent of the school year. 3. Prevent absences whenever possible. Some absences are unavoidable for example, when students have a serious or a contagious illness. But many absences can be prevented by identifying and resolving barriers to attendance. These can be related to transportation, bullying, inadequate supports for students with disabilities or a lack of engaging instruction. Reducing health related absences, such as chronic disease, lack of access to care, undiagnosed illness and anxiety, is key because illness is the top reason students and families give for missing school. Health professionals, particularly pediatricians and nurses, are allies for communicating with parents and schools about the importance of preventing school absences and connecting families to needed supports. 4. Students are more likely to attend school if they feel safe (emotionally + physically), connected, supported, and believe they can learn and achieve. School staff, especially teachers, play a primary role in creating an engaging school climate and culture that encourages students to attend and fosters student self-efficacy. Educators and community partners can help students feel they belong in school. 5. Relationship building is fundamental to any strategy for improving student attendance. Caring adults, such as teachers, mentors, or afterschool providers are critical to encouraging families and students to pay attention to absences adding up and to seek out help to overcome barriers. Trusting relationships motivate attendance even when it isn’t easy to get to class and encourage students to share the barriers they face. 6. Chronic absence is a problem we can solve when the whole community collaborates with families and schools. All of us can model problem-solving, engage students and families in learning and set the expectation that attendance matters. Community partners can also help address tough attendance barriers. 7. The key to success is to avoid laying blame and taking a proactive, positive, data driven, problem-solving approach. Data, both quantitative and qualitative, can show us where absenteeism is most concentrated (by school, grade, ethnicity, geography, disability, income, etc.) and help us assess and identify the causes of absenteeism. 8. Families, educators and community partners need to monitor how many days a student misses school. Families should track how many days their children have missed so they are aware of when they should take action. Districts and schools can use data to identify which students are chronically absent and provide extra support before they fall behind academically. A variety of community partners can inquire about absences, help to identify root cause and offer solutions. 9. Reducing chronic absence helps create more equitable academic outcomes, especially for children who live in poverty, experience discrimination and have disabilities. 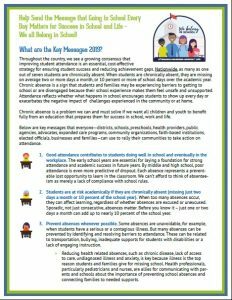 Chronic absence data can be leveraged to identify and address the school-wide and systemic barriers that impact our most vulnerable children who experience higher levels of chronic absence at younger ages. These children are less likely to have the resources to make up for lost learning time. 10. States can lead the way and encourage districts and schools to take action to improve student attendance. State leaders can ensure availability of timely data, support professional development, and allocate resources to address the school or community conditions that contribute to chronic absence. Chief state school officers can call for a positive, prevention-oriented approach, including participating in the national Attendance Awareness Campaign. Download the key messages in a printable format here.